I know I’ve been a little grumpy about Seinfeld’s eighth season, guys. But not today! Because “The Susie” is one of my favorites of the season and of the post-Larry David era. There’s a lot of reasons for that, but I’m going to link to the most important one here. I’d be fine with the episode if it just padded that moment out for 22 minutes. The plot is classic George – he wants to take his girlfriend Allison, who looks great in a backless dress, to a Yankee ball, but she wants to talk to him, and he knows what that means. So he goes off the grid to avoid her, including screening his calls, and we’re treated to that scene. The answering machine message comes out of nowhere and is dwelled on just enough (a passing reference from Allison, and a moment later on where Jerry hums it to himself). It’s the highest point in a generally strong episode. I don’t love where “George in hiding” goes from there, though, which is pretty much the only downside of “The Susie.” His efforts to hide out are thwarted by Kramer, who acts as a surrogate for Allison and breaks up with him. The only really stale material in the episode lies here: George and Kramer act all awkward around each other like they just broke up, which feels unoriginal. Things come together by the end, with Kramer taking George back but Allison declining, a testament to Kramer’s open-heartedness. His backless display at the Yankee ball is a little hokey, but it made me laugh like most of Kramer’s broader physical bits. The real star of the show here, though, is Elaine—the sudden birth, fraught life, and mourned death of her alter-ego Susie is one of her most memorable storylines. We’re more than two thirds of the way into season eight, and I’m really convinced at this point that it’s about Elaine’s journey to the bottom, much like season five’s focus on George. The problem with that is the Peterman company is so nutty and random that Elaine feels like a less active participant in her storylines. But the Susie plot is more well-balanced and is one of my favorite deployments of J. Peterman. In case you forgot, Elaine is mistakenly called “Susie” by her co-worker Peggy and, before she can correct her, Peggy disses Elaine’s work, which basically forces Elaine to assume the role of Susie to stick up for herself. That alone is a lot to work with, but things take a funny turn as Elaine objects to being called “Suze” by everyone and quickly ruins her alter-ego’s reputation as much as her actual one. The crowning scene is a conference organized by Peterman with Peggy, Elaine, and Susie—with Elaine somehow managing to play one part for one and one for the other without getting rumbled. Like most Peterman plots, it’s an exercise in absurdity, but it doesn’t involve Elaine flying to Asia or becoming a ghostwriter. 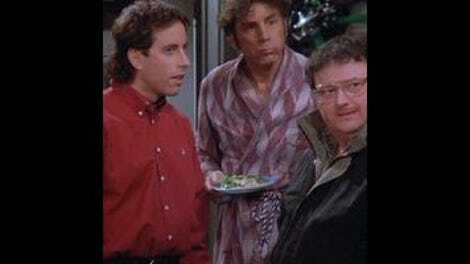 It’s all spun out of one weird little social miscue, like some of the best Seinfeld plots. The life of Susie even intersects with Jerry, who crosses paths with Mike (Lee Arenberg), the guy who called Jerry a phony way back in season three’s “The Parking Space.” Mike’s presence is a little baffling—he could just as easily be a new character, since his function in this episode is to be a bookie who ends up unable to pay Jerry and comically feels threatened by him. But Arenberg’s a funny dude, and Mike’s weird, aggressively sycophantic energy works for the part. That he becomes convinced that Jerry is the murdering type is a little silly—Jerry and Elaine’s maniacal laughter over a bumper sticker is the main thing, along with some gangster-esque mishaps where Mike’s thumbs get broken and he’s locked in Jerry’s trunk. But again, Arenberg’s energy makes it work, and the whole thing gets brushed off before it’s even resolved—Jerry’s cool face at Susie’s funeral is a great freeze-frame to end a great episode. In the opening scene, Jerry drops her toothbrush into her toilet by mistake, and before he can warn her, she’s brushing her teeth with it, and then Jerry can no longer kiss her. We’ve seen storylines revolving around Jerry’s fussiness about such matters before. But I like where “The Pothole” ends up—when she learns the truth, Jenna subjects Jerry to an extraordinarily brilliant form of torture, telling him she’s tainted an object from his apartment with toilet water, but not saying any more than that. It’s admirably evil stuff and Jerry’s subsequent mania is a lot of fun. I wish there had been more of it, because it’s nice to see Jerry get his comeuppance for such silly behavior. 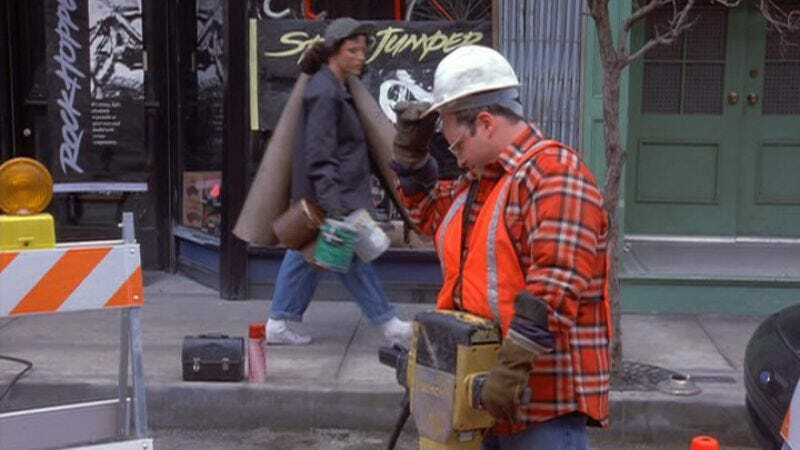 “Oh, now you’re finding fault on a subatomic level,” Elaine deadpans when Jerry says Jenna’s “tainted.” Instead, things wrap up on a slightly grosser note as Jenna gets drenched in sewer water because of a jackhammering mishap by George. Jerry gets to exit with a little too much dignity. Much like “The Susie,” Elaine’s plot this week feels like another example of her teetering on the edge, George-style—she ends up living in a broom closet and doing unpaid janitor work for a building just so she can eat a flounder dish that she seems only somewhat enthused about. The funny thing is, for the first half of the episode, it’s all about her getting one over the Chinese restaurant that won’t deliver to the south side of 86th Street. But then that kinda gets forgotten and you start to wonder why she’s keeping up the pretense and hauling trash to the street. It’s a good sight gag, but an even better character gag. Kramer and George have road-work subplots that I was less enthusiastic about. Kramer adopting a highway and wreaking havoc on New York traffic by widening lanes is a little disconnected—Elaine ends up driving down his lanes, but that’s it. At the end, Newman shows up at the end to cause a Looney Tunes-esque explosion that feels very out of place. George’s pothole trouble is a perfectly ordinary C-plot, but the sewer water denouement also strikes me as a little too wacky. Kramer proclaims himself a papa to Jerry. “Bring it on, nothing’s throwing me at this point,” Jerry sighs. That’s Jack McGee of Rescue Me and The Fighter as George’s pothole contractor.